What Edinburgh Taught Me – . 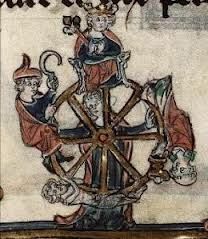 There are some times in life when the Wheel of Fortune seems to sit you at the top for no particular reason. That was me, up the top there, in late August, at the Edinburgh Book Festival. There was nothing not to like, and everything to love: Edinburgh’s beauty; the writers’ yurt (a real, felt-carpeted and cushioned yurt); appearing on a panel with the lovely Cecilia Ekbäck (Wolf Winter) in the gorgeous Spiegel Tent; meeting other authors, and listening to yet others. And the weather was mostly sunny! But there are two events I will always remember. The first was hearing Anne Enright speak about her latest novel, The Green Road, but most of all, hearing her read from it. Anne has a gorgeous Irish accent, and she has the Irish gift of story-telling aloud. I so admire writers who not only write well, but can also read spectacularly. (Perhaps all writers should do a drama course somewhere along the line…) The audience was mesmerised, so much so that Anne read two quite long passages. The novel continues her interest in family relationships, some of which reminded me of gatherings of my extended family in England when I was a child. I’d never imagined seeing what Anne can see: that they could be fascinating and excruciating at the same time. The second reading was a description of a woman at the supermarket on Christmas eve, shopping for Christmas dinner. As someone who hates supermarkets, and especially busy ones, I couldn’t imagine a less attractive subject to write about. Really. But through some kind of magic, Anne’s writing is riveting and funny, while still dancing around the questions of family. And her reading was superb. In the questions session at the end, one woman asked when Anne would be coming to her house to read the novel to her. We cheered. Bring it on. The second highlight for me was being asked to do a short reading at the Amnesty International tent. Each evening, three or four writers were asked to read accounts of the experiences of those who are imprisoned or persecuted, and each day, an audience of about 50 people came to listen. It was physically an easy thing to do, even if the material was confronting, and it was honestly an honour to be asked. I was grateful to be able to do something publicly that wasn’t about me or the novel. Just before we went in to read, I commented to one of my fellow readers that I was glad to do this: ‘Writers’ festivals are great, and I’m so grateful for the opportunities, but they can easily be …’ I hesitated. ‘Self indulgent?’ she said quickly. Exactly. And that’s not a fault of the festivals themselves. It’s a matter for us writers. We work hard and writing can be hard, but it’s a great life, to live from words. Festivals are the cherry on top. Reading the words of someone else, about someone who has been persecuted for their words, is a good dose of reality, and helps put this writing gig into perspective. Thanks Gill. Yes, it’s not easy reading your own work, and I’ve sometimes thought I’d prefer to have someone else read it. But a little while ago, a friend commented that he’d rather hear the author read their own words, even if it’s not great, because they know them so well. That has made me think again. For all that, though, I’d love to have a bit of Anne Enright …. Thanks Clare. It was an amazing time. I felt so fortunate to be there, and especially so as a writer.